Following the success of the JF545, the market debut of a new, even more competitive, better performing and lighter model, thanks to the absence of a counterweight. The JF365 – developed by the Treviso-based company, an international leader in the mini crane sector in partnership with Fassi, – will be presented at the IAA 2018 trade fair, on the Fassi stand, represented by the dealer Nordkran, with the aim of continuing the story which began a year ago with the market debut of the first articulated crawler crane, the JF545. “Following the success of the JF545 – explained Alberto Franceschini, Sales Manager for Jekko – we decided to maintain the same format and the same configuration, substituting the crane element with one of Fassi’s best sellers, the F365, which operates in the same way as the 545 but without a removable counterweight, resulting in a more compact and lighter crane while offering the same performance”. The JF365 has a fixed base with a load capacity of 3 tons. It offers the same options as the JF545: Proportional radio controller, hydraulic activation for accessories, stability control with infinite possibilities for stabilisation, 1 smaller and lighter jib which allows for the installation of a platform on the main arm. The crane can be managed entirely by a single operator thanks to the use of a radio controller, which is effectively an extension of the machine that is always within reach. 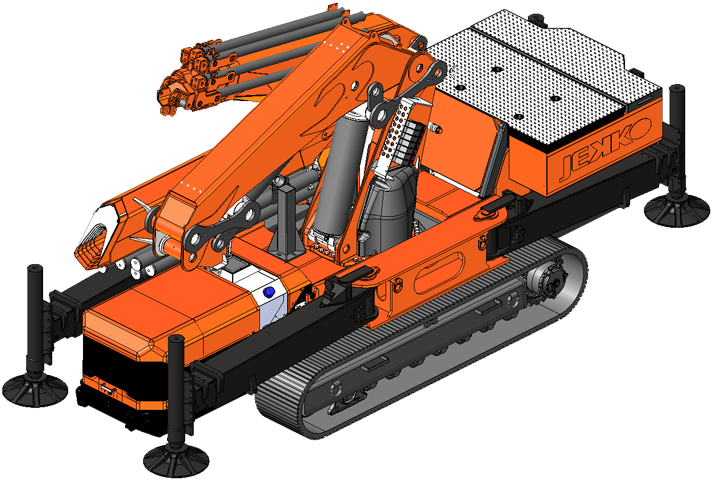 This allows the operator to carry out all operations in complete autonomy: activation/deactivation, crane manoeuvres, stabilisation, jib integration. The JF365 has both a 55 kW Kubota diesel engine, and a 13 kW three–phase electric motor. According to the situation and to requirements, the operator can easily switch between one or the other with considerable flexibility, for either internal or external use. It is the perfect machine for companies which specialise in lifting, integrating an existing fleet of truck-mounted articulated cranes and city cranes, as well as for companies specialised in the rental of equipment with or without an operator. It is ideal for those specialising in niche operations, with high and extremely particular demands, but is suitable in general for all those wishing to exploit the typical advantages offered by an articulated crane in areas which are inaccessible for a truck. In general, the market demands smaller machines which offer the same lifting capacities as their larger counterparts, for obvious reasons of cost, potential, logistics, maintenance and ease of use. The new JF365 was created for this very reason. “We will be launching this crane on the German, Scandinavian and central European markets, naturally without neglecting Italy – explained Franceschini – The JF365, and the JF545 before it, are cranes which are a great source of pride for us, as on an industrial level we were the first to introduce this revolution to the market and now many brands in the crawler market are following in our wake. This means that we have chosen the right direction, obviously following the philosophy of Made in Italy”.